Noratus cemetery in Armenia has 800 khachkars dating to 9th-17th centuries. 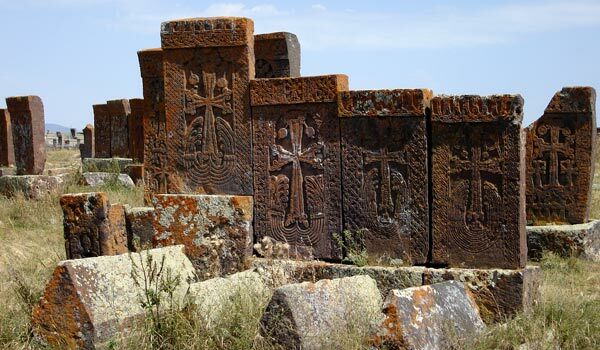 A United Nations agency advancing international collaboration through education, science and culture has accepted Armenia’s application to declare Armenian khachkar (cross-stone) art part of intangible cultural heritage of humanity. The decision was made on Wednesday at the fifth session of the Intergovernmental Committee of the states that are signatories of UNESCO’s Convention for the Safeguarding of the Intangible Cultural Heritage. Among the 47 applications put on the agenda of the session hosted by Kenya’s capital Nairobi (November 15-19) the first “intangible cultural heritage” application was submitted by the Republic of Armenia (Armenian Cross-Stones Art: Symbolism and Craftsmanship of Khachkars) which presents the origin, the chronology of development, composition, pictography, national ideas, the role of khachkars in the lives of people, functions and forms of manifestation, as well as developments of modern khachkar making. Peking Opera, Spanish Flamenco and the art of French gastronomy, as well as Chinese acupuncture and Traditional Mexican Cuisine also won places on UNESCO’s list of intangible world heritages to preserve. “This was a very important process, thus it is established that this culture is exclusively Armenian,” Armenian Ministry of Culture Public Relations Department head Gayane Durgaryan told ArmeniaNow. Even though the Azerbaijani side made a claim that the name of the application be changed to “Symbolism and Craftsmanship of Armenian Khachkars”, explaining that khachkar craftsmanship is not only Armenians’. However, as a result of long discussions the Intergovernmental Committee did not accept the Azerbaijani side’s claim. A khachkar is an elaborately engraved stone slab, with a cross being its main element. A khachkar is an inseparable part of Armenian culture.